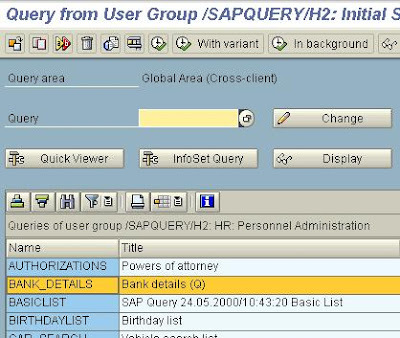 Before users can create and run their own reports, an administrator must create a functional area and a user group. 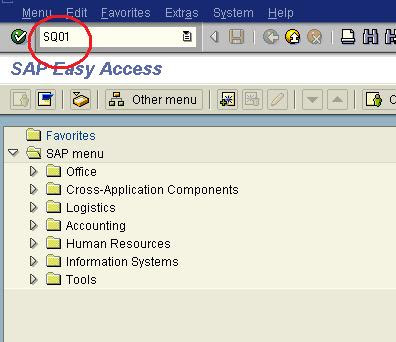 These are created using the ABAP query component and necessary to set up the appropriate working environment for end users. The R/3 System contains hundreds of thousands fields in logical databases and tables and a logical database is simply a special ABAP program that combines the contents of specific database tables. For example the logical database “PNP” contains all tables related to HR Master data. Since a user cannot be presented with thousands of fields to choose from – even from one particular logical database, to create a report, functional areas are created. When creating a functional area, first a logical database is selected, such as PNP which contains all the relevant tables for a particular module or sub-module. When selecting PNP which is relevant to HR master data, the administrator needs to pick which infotypes should be included in that particular functional area from the total number of infotypes attached to the logical database. A functional area determines which fields of a logical database can be evaluated in queries. A functional area also allows defining auxiliary fields. In many cases, the information that a logical database supplies is insufficient. For this reason long texts are normally stored in tables that are not part of the logical database. These long texts are, however, useful when evaluating queries, for example when you want to display the full text of an advertisement (within recruitment) rather than just its number. Both additional tables and additional fields can be added to a functional area. 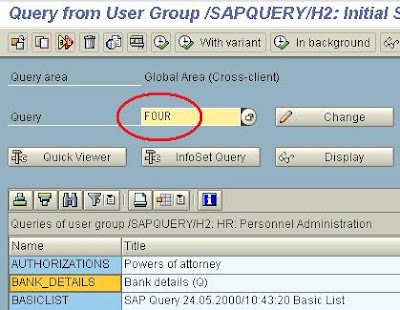 Any table can be added as additional tables, provided they are defined in the ABAP Dictionary and when adding a field, the ABAP code must be specified and the field assigned to a functional group. By creating functional areas and assigning them to user groups, the system administrator determines the range of reports the end-users can access. 1) Which logical database do we need data from? PNP – HR Master and time data, PCH – Personnel Development, PAP – Applicant Master data or other? Choose Database PNP if you want to create a functional area covering only Human Resources master data and/or time management data. Choose PCH if you want to create a functional area covering only Human Resources Planning data. Choose Database PCH, (since this database can refer to Database PNP) if you want to create a functional area covering Human Resources master data and following an organizational structure from Human Resources Planning. 2) Which infotypes do we need to include in the functional area? 3) Is there any information we need that is not available in the logical database? If so, where is this information? This step might involve having to create additional fields – (e.g. to display the long text of the ethnic origin instead of the code only). 4) What should the report selection criteria be? For example, employee subgroup, job, personnel subarea etc.